Disruption of the extensor mechanism at the level of the DIP joint. Caused by forced flexion of the extended DIP joint. Conjoined lateral bands are made up of the lateral slips of the extrinsic extensor tendon and the lateral bands from the intrinsic interosseous and lumbrical muscles. P/A, oblique, and lateral radiographs of finger. 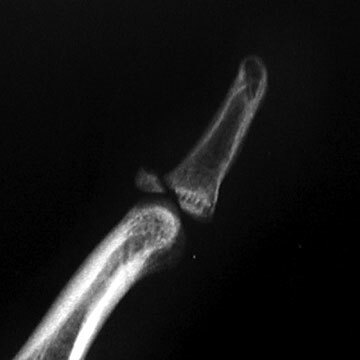 Often normal, may show avulsion fragment, or articular fracture. Closed No fracture or fracture involving <1/3 of the articular surface = involved digit immobilized in full extension or hyperextension across the DIP joint. 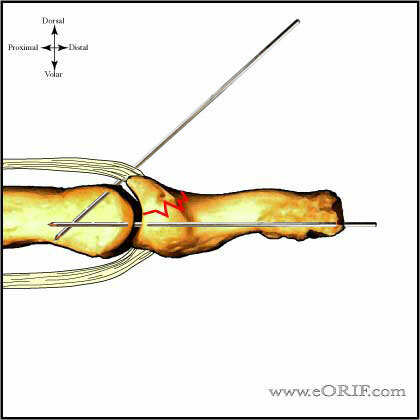 PIP joint is generally not immobilized. Maintain for 8weeks, followed by nightime splint use for 2-3 weeks. 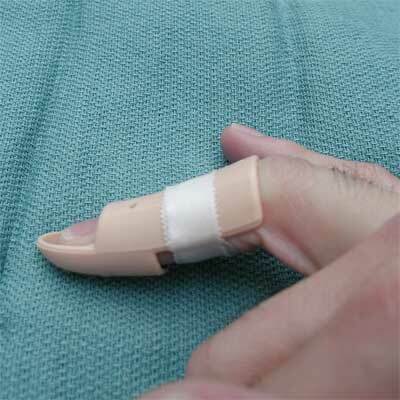 Splinted period must be restarted if patient inadvertently flexes finger during treatment period. 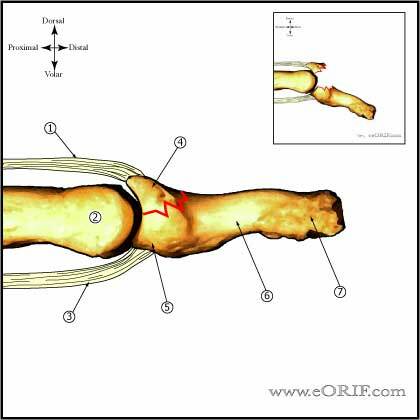 (Okafor B, JBJS 1997;79B:544) Full time extension splinting for 8 wks even up to 6 months after terminal extensor tendon rupture leads to good results in the vast majority of patients. Surgery is rarely necessary. 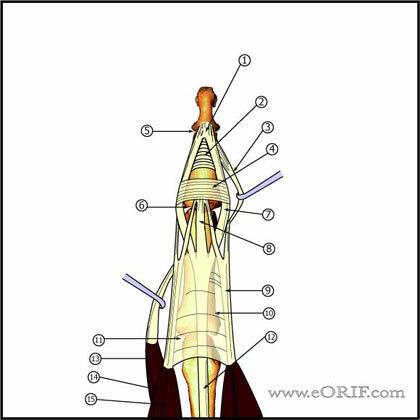 Open = lacerations are generally repaired with running suture reapproximating both skin and tendon +/-longintudinal K-wire fixation of DIP joint in extension. Post-op /Initial: Place in alumifoam extension / clamshell / Stack splint. Elevation. 7-10 Days: xray to ensure reduction is maintained. Continued splint, activity modifications. Immobilize as few joints as necessary. 6 Weeks: Remove k-wire, wean from splint use as soon as callus is visible on xray. Continue activity modifications. Agressive DIP ROM. 3 Months: Resume full activities. Assess ROM. Wehbe MA, Schneider LH: Mallet fractures. J Bone Joint Surg 1984;66A:658-669. Stern PJ, Kastrup JJ: Complications and prognosis of treatment of mallet finger. J Hand Surg 1988;13A:329-334. Garberman SF, Diao E, Peimer CA: Mallet finger: Results of early versus delayed closed treatment. J Hand Surg 1994;19A:850-852.